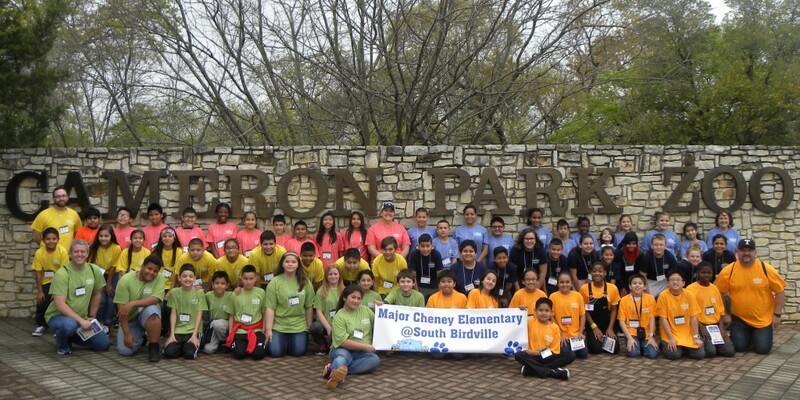 Cheney Elementary fifth graders travel to Cameron Park Zoo, Waco Mammoth National Monument, and Inner Space Cavern on an Education in Action Discover Texas Field Trip | Birdville ISD Blog! Fifth graders from Birdville ISD’s Cheney Elementary traveled to the Cameron Park Zoo in Waco, Waco Mammoth National Monument, and Inner Space Cavern in Georgetown on an Education in Action Discover Texas Field Trip March 8, 2016 to experience what they are learning in science class. At the Cameron Park Zoo, students explored the Brazos River Country exhibit, tracking the Brazos River from its source near Lubbock on to the Gulf of Mexico. Students investigated many animals living in the five ecological regions of Texas through which the Brazos River passes with a focus on each animal’s unique adaptations and ecological niche. Next, the students experienced the nation’s first and only recorded discovery of a nursery herd of Pleistocene mammoths at Waco Mammoth National Monument. While viewing the in situ, sub-fossil remains of six Columbian mammoths and other Ice Age animals, the students learned about the Ice Age, how the fossils were discovered, sedimentary rocks, and why the site is one of the most important paleontological sites in North America. Throughout the day, the students participated in numerous hands-on activities to learn about many of the Earth’s cycles, systems, and processes. Students learned about the water cycle, the environmental benefits of the world’s wetlands, and watersheds through participation in hands-on demonstrations. The student scientists discussed the rock cycle and worked in groups to classify rock, mineral, and fossil samples. At Inner Space Cavern in Georgetown, students panned for, and identified, minerals found in the cavern. The students concluded their day by watching the Earth’s processes at work as they toured the highly decorated Inner Space Cavern.